You are here: Home / Article Knowledgebase / Gem Therapy for Fear, Social Anxiety and Ambition for high performance in academics? Gem Therapy for Fear, Social Anxiety and Ambition for high performance in academics? This Share is a part of Share Gem Therapy Objectives and Case Studies. At present I’m in 3rd year doing Computer Engineering. Things are going haywire. I’m forgetting things. Lot of mental agony, fear, social anxiety, ego, irritation, frustration. Also I’ve become very thin. Want to get healthy, fit and fine. Want to perform excellently in all exams in college. Later on completion of engineering want to get a fat salary job (please do suggest me on whether I should go in business line or go for a job). Want happiness. I don’t have any friends, so want a fix for this. Want to become wealthy. Want to become intelligent with super memory. Kindly suggest me the best gems/ remedies to overcome these issues. At the time of placement of this order the patron was undergoing the Major period of Rahu and his objective statement show all classical symptoms of Rahu 5D Modus Operandi period problems including fear, loneliness, lack of self esteem, and lack of integration into the society. There is a fair degree of ambition plus a fair degree of pressure being created by future goals and expectations. In a single objective statement there are mental goals, physical goals, financial goals, social goals and also career goals. A three pronged approach was taken for Gem therapy in this case. The first approach was to pacify the Rahu which was the immediate need since its period was in operation. This is was the single most important key in success to Gem therapy as its major planetary period was in operation and till the veil of confusion was lifted the path ahead would not be clear. The second approach was to fortify the ascendant Lord Moon that would function like a shield, provide health benefits, boost immunity and since Moon is a Karaka of the mind bring in emotional and mental stability and a state of equanimity leading to better decision making. Finally to complete Gem therapy and to make it wholesome the Gemstone of Jupiter who becomes the 9th Lord in his chart was advised. Yellow Sapphire blesses with abundance, peace, prosperity, a positive outlook, freedom from doom and gloom in addition to also keeping the malefic Rahu in check to a certain extent. This three pronged approach led to overall satisfactory developments in life and a positive outcome. Comments Featured today is a gorgeous Unheated Yellow Sapphire from the famed mines from Ratnapura set in 22 K Gold Ring. 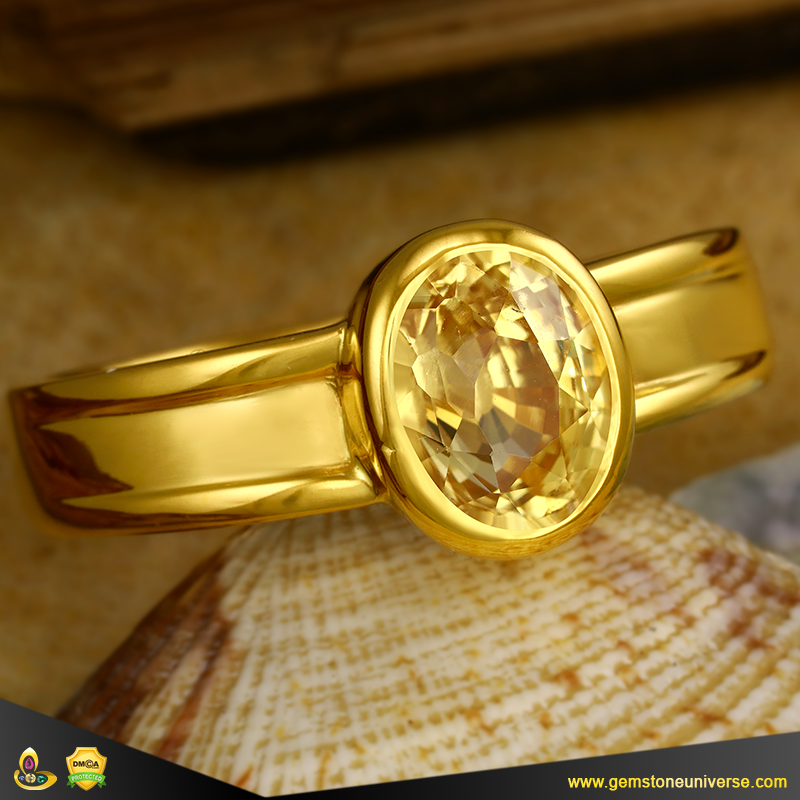 A fine Example of a True Jyotish Gemstone, this beautiful evenly colored golden colored Yellow Sapphire is Eye clean. Natural Earth Mined Unheated Yellow Sapphire from the hallowed earthly gravels of Serendib this rare miracle of Nature is eye clean. Fashioned into a beautiful symmetrical oval mixed cut with an unparalleled lustre and razor sharp movement of light this is a fine example of the glorious purity of fine gemstones that the famed texts like Garuda Purana and Agni Purana Speak about. A wondrous miracle of nature that shall deliver the cherished results that only true Jyotish Gemstones can deliver and promise. A Gemstoneuniverse special as always.